Another intrigue surrounding the future of the political reform concerns the Constitutional Court of Ukraine. Specifically, the Kommersant-Ukraina published information that on February 15, 2006, the Constitutional Court of Ukraine voted on the law “On Amending the Law of Ukraine “On the Constitutional Court” prohibiting the Constitutional Court from reconsidering the political reform provisions.”The draft decision on reversal of the law was supported just by six judges out of the required minimum of ten votes. Despite the fact that voting did not produce a final result, it is safe to conclude that the Constitutional Court will not allow reconsideration of the constitutional reform,” the newspaper wrote. Nevertheless, the next day, at his first press conference as Chairman of the Constitutional Court, Ivan Dombrovsky denied information of voting on abolition of prohibition on the political reform’s reconsideration. Presently, the Constitutional Court actually takes the lead by the number of references in different political statements, reports and speeches. It is appealed on the occasion of possible dissolution of the Verkhovna Rada or recognition of 10% of presidential decrees unconstitutional or the law on the Cabinet of Ministers and its compliance of its actions with the established procedures etc. Needless to say, the Constitutional Court is the only governmental agency that can and has to dot the “i’s” and cross the “t’s” deciding the future of Ukraine’s political system in the context of the constitutional reform, ensuring balanced actions of government departments and explaining documents that regulate powers and relations within the Verkhovna Rada – the government – the President triangle. It is difficult to forecast both the price for the answer to these questions and consequences, which will depend on the decisions of the Constitutional Court and the decision-making period. Most likely, the revolution will not occur in the near future, while cases will be considered for long. The above conclusion is based on recent activities of the Constitutional Court. It has to be stated that the Constitutional Court of Ukraine has not been working properly for nearly two years. The Verkhovna Rada of the 4th convocation could not (and, probably, didn’t want to) hold by-elections of the Constitutional Court judges by its quota and swear them in. The major sticking point in this issue was the political reform or rather the opportunity it gave to interpret its provisions that came into effect from January 1, 2006. After the parliamentary elections, MPs also were not in a hurry to decide on by-elections and adjuration of the Constitutional Court judges. Legal motivations were limited to the absence of the Head of the Verkhovna Rada, who could sign the parliamentary decision on adjuration of constitutional judges. The situation was paradoxical also because in summer 2006, the number the constitutional judges appointed by the Congress of Judges of Ukraine was enough to secure a quorum in the Constitutional Court or the beginning of its proper work. Vice Speaker A. Martynyuk once commented on the first decisions of the Constitutional Court as saying, “The presidential entourage spares no effort to make the December 8, 2004 voting (when 402 votes were for amending the Constitution) the first case to be considered by the Constitutional Court.” Yet, it was the Verkhovna Rada or rather the anti-crisis coalition that invented a method to pass a respective judgment not in the first turn. Yet, the Constitutional Court seemingly has found itself in a rather delicate situation. In view of the ongoing “cold war” between the government and the President, constitutional judges have chosen a respective tactics: to hasten slowly… Of course, they had every reason to act that way. According to official information available on the site of the Constitutional Court, there are 49 constitutional petitions in the Court, of which 23 are pending as of February 12, 2007. 6 out of the 9 constitutional submissions by the President of Ukraine are under consideration by the Collegium of Judges and 1 – by the Secretariat of the Constitutional Court. 4 constitutional petitions are filed by the Cabinet of Ministers of Ukraine. As the media reported, on September 19, 2006, MP Mykhailo Pozhyvanov of Our Ukraine faction registered a constitutional claim by 47 MPs against unconstitutionality of the anti-crisis coalition’s brain-child – the law that actually prohibited the Constitutional Court considering legitimacy of the December 2004 changes. Interpretation of amendments to the law on the Constitutional Court as unconstitutional offered, at least, a theoretical possibility of raising the issue of constitutionality of the political reform. Nevertheless, the situation stood still for six months. According to information on the site of the Constitutional Court of Ukraine, on the consent of the Collegium of Judges, constitutional proceedings in case of constitutionality of the August 4, 2006 law No. 79–V “On Amending Section IV “Final and Transitional Provisions” of the Law of Ukraine “On the Constitutional Court” were initiated on January 18, 2007. So, the Constitutional Court has, at least, another two months to pass its verdict. Should these changes be found constitutionally compliant, it would be vain to hope for proceedings on legitimacy or illegitimacy of the political reform. Chairman of the Constitutional Court Ivan Dombrovsky believes that revision of the law on the Constitutional Court and/or drafting of a new act with regard to the new Constitution may be a solution. However this would again take time and raise paradoxical or tricky questions, e.g. to what extent is the law on the Constitutional Court constitutional, if it is drafted on the basis of the Constitution, changes to which it may recognize unconstitutional? Corresspondence received by a number of sources has confirmed that the English translation version of Ukraine’s constitution as published on the Ukrainain President’s Official Web site is outdated and false. The version published by the Venice Commission (copy here) is the updated version as provided by Ukraine’s Justice Ministry. A number of commentators and reports in the western media has incorrectly stated that the President has the power to appoint the Prime-minster, the Foreign Affairs Minister and the Defence Minister. In what the US claims to be a military installation that is designed to protect both Europe and the US you would think that the US would have consulted and sought the approval of the EU member stats and as a minimum the membership of NATO. It seams that the US has decided to pursue its own agenda and snub the opinion of NATO and the European Union. I have not heard of conversations with the European Union, primarily because this is not within the competence of the European Union. This question is clearly within the competence of individual member states. I don`t think so. This has not been a decision for NATO. It does affect conversations on security issues with two NATO members. But it does not require decisions by NATO as a whole. If the proposed military installations are to protect European countries from a threat in the middle east then why is the military based not managed by European countries themselves? It seams on the surface of it that the United States is prepared to impose its preferred defence system on Europe and if need be intends to ignore the need for consensus and agreements with its allies, the very people that it claims it is acting to defend. There is growing concern about US activities and many believe that the proposed missile base in Poland and the US radar installation in the Czech Republic will pose a threat to the EU. The fact that the United States is prepared to “go it alone” and is seeking to negotiate directly with individual states will most certainly create some tension in the already fragile alliance. Opposition to NATO is on the increase and the proposed Missile installation might just be the catalyst for a rethink on the alliance itself. There are many who believe that the NATO alliance needs reform, that Europe should create a truly independent European alliance and that involvement with the US be by association on common interests as opposed to membership. The US having already snubbed the United Nations and dragged Europe into a war again non-existent WMD in Iraq is now treating with contempt its alliance with Europe, creating growing tension and discord between Poland, the Czech Republic and other EU members states. Recent polls in Poland and the Czech Republic indicate that over 50% of Polish and Czech citizens are opposed to the US military installations. The possible deployment of elements of an anti-ballistic missile defence system on the territory of the Czech Republic and Poland is being widely discussed in the political circles of Europe, Russia, and even Ukraine. The US says that the deployment of anti-ballistic missile defence elements in Europe by 2011 is aimed at protecting American and NATO installations from enemy threats coming from the Middle East, not Russia. This was announced on Jan. 29 by US Army Brigadier General Patrick J. O`Reilly, Deputy Director of the Pentagon`s Missile Defence Agency. The general also announced that the US is already negotiating with Russia about American plans in the National Missile Defence (NMD) sphere and inviting the Russians to take part in its implementation. He says that Russian participation in this process will strengthen Russia`s defence potential. However, the Russian side views this as a threat. Russian President Vladimir Putin called the statement by supporters of the deployment of an anti-ballistic missile defence system in Eastern Europe to warn against threats coming from Iran ungrounded and expressed confidence that Russia`s reply will be asymmetrical and effective. Some politicians in Ukraine also think that the deployment of anti-missile defence systems in the Czech Republic and Poland will be a threat to Russia. After his meeting with US Ambassador to Ukraine William Taylor, Ukraine`s Minister of Defence Anatolii Hrytsenko expressed the opinion that the US has lost the information campaign on the possible deployment of their NMD elements on the territory of the Czech Republic and Poland. Hrytsenko said that Europe`s reaction to the deployment will depend on the purpose of these systems. The Day asked Ambassador Taylor to explain the purpose of the US deployment of NMD elements in Europe. [The Day] From the reports in the mass media it looks as if nobody understands why the US needs to deploy elements of the National Missile Defence: a radar in Czech Republic and anti-ballistic missiles in Poland. Can you explain to our readers what the purpose of this deployment is  to defend what from whom? [Amb. Taylor] I`m very glad to give you the best explanations I can. We think there is a very clear answer to that question. We are interested in talking to the Poles and the Czechs in order to improve the security of Europe and the United States. We think we improve the security of Europe and the United States by placing these systems or at least negotiating to place these systems in Poland and the Czech Republic to resist the emerging ballistic missile threats from the Middle East. These systems, if these countries agree, will not protect Europe or the United States against missiles fired from Russia. The decision on where to place the anti-ballistic missile systems is made on the basis of geography and geometry. Experts and analysts in our Defence Department have spent a lot of time doing that geometry. And as an expert, you can probably understand better than I. But as I understand it, that analysis shows that Poland and the Czech Republic are newly optimal locations if we are defending against missiles coming out of pariah- states in the Middle East. [The Day] You mentioned Poland and the Czech Republic, but I have heard there was an inquiry from two MPs, who are asking whether the US is also talking to the European Union, because those two countries are members of the EU. [Amb. Taylor] We are certainly keeping our NATO allies informed. By the way, we are trying to keep our Russian friends informed. I have had many conversations with Ukrainian officials about this. [The Day] But NATO is one bloc, while the European security system is another, and they do not always overlap. Is the US taking this fact taken into account? [Amb. Taylor ] In this sense you are right that NATO members are not exactly the same as European Union members. Yes, EU members that are not members of NATO, we don`t have the same level of military defence and n ational security dialogue as we do with NATO allies. [The Day] Is there consensus in NATO? Will NATO consensus be needed to reach a final decision on this particular matter? [Amb. Taylor] I don`t think so. This has not been a decision for NATO. It does affect conversations on security issues with two NATO members. But it does not require decisions by NATO as a whole. [The Day] How would you explain the objections of Russia and even former Ukrainian defence minister Kuzmuk, who says that this deployment, those elements of missile defense, will be a threat to Russia? [Amb. Taylor] Honestly, I don`t know. As I said in response to your first question, these systems, if they eventually agree, will have no effect on Russia. Indeed, they would provide some defense for Russia, which should be concerned about missiles coming from Iran, as well as Europe and the United States. During a recent press conference President Putin hastened to say that there would be an adequate response from Russia to this threat connected with the deployment of the US National Missile Defense in Europe. Since there is no such a threat, I don`t know what an adequate response will be. However, this statement may be true: if he speaks of an adequate response to a threat, an adequate response to no threat is no response. [The Day] You mentioned your discussions with Ukrainian officials about the deployment of elements of the National Missile Defense in Europe. What was their reaction? Were you able to convince them of the necessity of such a step? [Amb. Taylor] I don`t know, you had better ask those Ukrainian officials if they are convinced. However, I`ve been very pleased with the nature of the discussions with Ukrainian officials. They recognize the geography and geometry questions that you and I have spoken about. [The Day] If the Czech and Polish governments approve the decision to deploy elements of the NMD, is there a possibility of engaging Ukraine, possibly together with Russia, to take part in the work to implement this project? [Amb. Taylor] The answer is built into your question. Yes, this problem can best be examined after the discussion with the Poles and Czechs. But during those discussions we will keep our Russian friends and our Ukrainian partners well-informed of the progress of these discussions. [The Day] Why, in your opinion, have many high-ranking Russian military men and defense experts from the very beginning rejected the possibility of getting Russia on board regarding the deployment of anti-missile defense elements in Europe? [Amb. Taylor] I don`t know why the Russians take the actions they do. But in any case, any participation in this anti- missile program would be purely voluntary on the part of the Russians or Ukrainians, or the Czechs or Poles. [The Day] There is some public concern, and even polls in Poland show, that more than half the population is not in favor of such deployment, and there are rising protests in the Czech Republic against the placing of the radar. In light of this situation, will the United States insist on carrying out this project? ]Amb. Taylor] No, we will not insist. This is a decision for the government of Poland and the government of the Czech Republic. We are not insisting now and will not insist in the future. This will be a decision for those two governments. They are fully sovereign governments, they represent their people, and we fully respect them. [The Day] How would you explain the opinion voiced by some politicians that the US has already lost the information part of this campaign? [Amb. Taylor] The United States must do this – explain our rationale for these discussions taking place concerning these deployments to the people and reporters who have questions about this. I think we have convincing arguments that these systems are directed at missiles coming from the Middle East. If these systems are deployed, Europe, including Ukraine, and the United States will be more secure. We need to be clear about that calculation. map. The next question is explaining ourselves. I think it is this kind of analysis and conclusion and the fact that the weapon systems placed in these areas will defend the United States and Europe. This is the most important argument. [The Day] What is the deadline by which the Polish and Czech governments should make their decision? Has one been established? [Amb. Taylor] I don`t know about any deadline. The discussions, or serious negotiations, will begin in a couple of months; they will only start in a couple of months. [The Day] Is this a good time for the initial disclosure of this information, considering that the Russian elections are approaching? [Amb. Taylor] The time to begin talking about this was not based on political decisions like the Russian elections. The time was based on when the discussions were necessary in order to keep the planning going of the deployment of these systems. President Bush released the National Policy of the Anti-Ballistic Missile Defense in May 2003. In this policy it was explicit that this was to defend the United States as well as their friends and allies. So, this has been the US line for four years, since 2003. 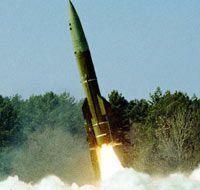 [The Day] Do you believe that at some point in the future Russia and the US, as countries with huge arsenals of ballistic missiles and ballistic missile capabilities, will join forces to create a shield not just for part of the world but the whole world? But not every country believes this, especially Russia, that the two countries you mention are irresponsible. The Russians, I think, agree with us that Iranian and North Korean nuclear weapons are a threat. [The Day] Why is there no agreement or mutual understanding between the US and Russia with regard to the deployment of the American NMD system in Europe? [Amb. Taylor] I believe that the Russians, some Ukrainians, some Poles, some Czechs, as they think this through and look at the analysis, in the end they will agree that they will be better off if there are preventive measures against these threats. You are currently browsing the Ukraine Today blog archives for February, 2007.